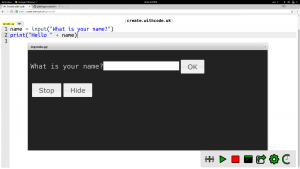 Create.withcode.uk online python editor is now open source! Create.withcode.uk is an online python editor that allows you to write, run, debug and share python code in your web browser. It launched in April 2016 to help students learn to write code on any device without having to install any specialist software. In June 2016 I added a BBC microbit simulator to make it easier for my students to write, debug and share python code for a BBC micro:bit. Since then, I’ve been approached by a number of different people to see if they can adapt or extend some of the features on this site. All of the resources on this site are published under the Creative Commons share-alike license which means you’re free to use anything here for whatever purpose as long as you reference me as the original author. Up until now though, whilst create.withcode.uk has been free to use, the source code that makes it work hasn’t been openly available. I’m really grateful to those of you who have got in touch to request a feature or report a bug but I’ve been really impressed with the response to the site from people who have ideas of how to make it even better. I’m pleased to announce that create.withcode.uk is now open-source. This means that if you can think of a way to improve the python editor or you spot a bug that needs fixing, you don’t have to wait for me to code it: you can jump right in and adapt / extend / improve it however you like. You’re free to use it for your own projects – I’d love to hear from you if you find a use for it. You can find the source code for create.withcode.uk here. The possibilities are endless (but time is very limited!) so hopefully going open source will allow someone to get creative and innovative without me holding them back!